A week ago it seemed like the world was coming to an end. The Warriors had gone down 3–1 in their series against the Oklahoma City Thunder, losing two games in OKC by 28 and 24 points. 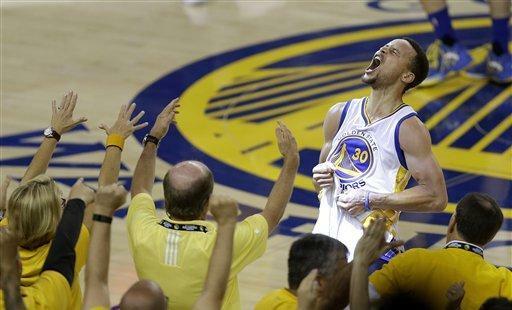 Steph Curry looked like a regular human, turnovers were running rampant, the defense was porous and disorganized. The lasting image stuck in everyone’s minds was Draymond Green kicking a 7-foot New Zealander in the stones. But today the sun is shining, birds are singing, and the Warriors are headed to the NBA Finals after finishing off the Thunder in a heart-bursting, head-spinning, highlight-stuffed Game 7 in Oakland. It was ugly early, with both teams struggling to score, but the Dubs struggling much more. At the 6:15 mark of the 2nd quarter they were still stuck on 22, with the Thunder having managed a relatively robust 35. That was when Klay Thompson made his first three-pointer of the night, and the lid finally came off the basket. The home team closed to within 4 at 37–33, but then seemed to lose focus for awhile, and it took a ridiculous left-handed high-arcing layup from Steph Curry to get them within 6 at the half. The third quarter went much better. Steph made some shots, Klay hit some shots, Andre Iguodala hit some shots. Once they got it rolling, even Anderson Varejao chipped in, sinking a much-needed floater with 58 seconds left in the quarter. At the end of the 3rd the Warriors led by 11, having outscored the Thunder 29–12 in the quarter. But nobody was ready to celebrate yet. As they had throughout the series, in the 4th quarter OKC gave the Warriors all the challenge they wanted and then some, repeatedly closing the gap and getting to within 90–86 with 1:17 left. I was pacing the floor here at home as the W’s took one time out, then another, desperately needing a score to stem the tide. Then Steph Curry raised up to shoot a three pointer…and didn’t make it…but wait! A foul was called on Serge Ibaka. That gave Steph three free throws — which of course he made, being who he is — and the Warriors a 7-point lead. And that was pretty much that. The moment that will probably stick in people’s minds came at the :26 mark, with Steph dribbling around to kill some clock and then calmly, cleanly draining one last 3 to raise the lead to 10. That was when we felt ready to celebrate. And I think we still feel that way today. When they had their backs against the wall, the W’s came out swinging, and they have to love themselves for that. And yes, I’m spouting cliches left and right, but I don’t even care today; my team is going back to the Finals, and yeah, it feels good. This entry was posted	on Tuesday, May 31st, 2016 at 3:20 pm	and is filed under Golden (State) Years. You can follow any responses to this entry through the RSS 2.0 feed. You can leave a response, or trackback from your own site.